What guy wouldn’t love to have his own special space to get away from it all? Well guys, there’s only about a month left until Christmas Day. Have you figured out what you’re gifting to your nearest and dearest?? Today I’m writing about a slightly unconventional gift to give your man. If you have an unused bedroom or office or a basement that needs a little love, turn it into a man cave! What guy wouldn’t love to have his own special space to get away from it all? I know my husband would be thrilled; his own little sanctuary to get away from my lists of home reno projects and my trash TV addiction. 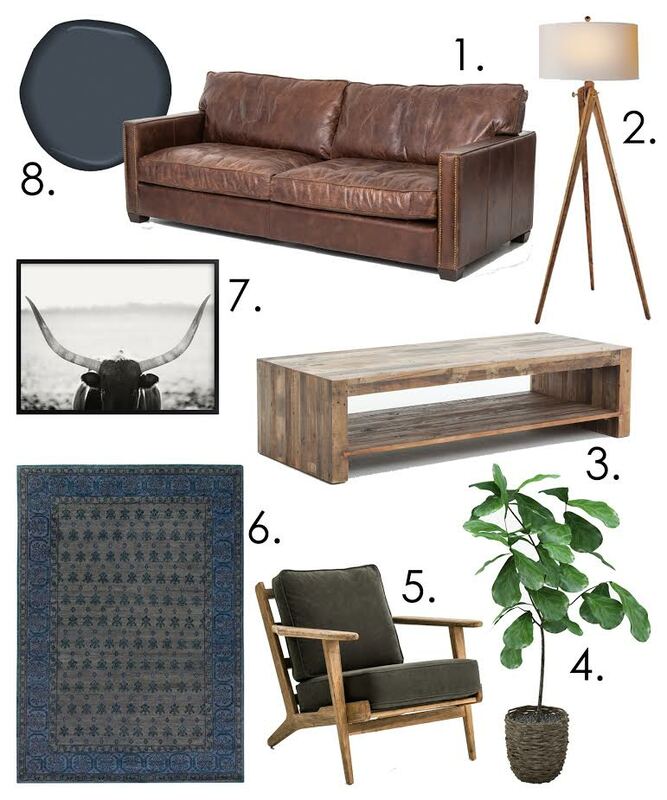 This may seem like a daunting gift, so I’ll break down the components of what I think makes the PERFECT man cave (if your guy would be happy with just a kegerator, the NFL network, and a craigslist sofa, you may want to disregard this blog post). 1. Leather Sofa. A large leather sofa is the perfect seating option for your man cave. As the leather becomes more and more worn, it will only become better looking and more comfortable. Leather is also super easy to keep clean, so you won’t be worried about spilled Old Fashions or sticky chicken wing fingers. Pick out a sofa shape that is angular for a more modern look or get a tufted chesterfield sofa for more of a “gentleman’s club” feel. 2. Lighting. Task lighting is important and your best bet is an attractive floor lamp. A floor lamp is much harder to knock over and you won’t have to worry about bent or stained lamp shades. I love the tripod style because of the added sturdiness and the simple clean lines. 3. Reclaimed Wood. While I am slightly over the barn wood craze (don’t be mad at me), there are some places where you just can’t beat some reclaimed wood. A coffee table in ANY room gets a lot of wear and tear and a man cave is definitely no exception. You want your guy to be comfy, put his feet up and not be worried about scrounging around for a coaster. A chunky, rustic piece not only adds some warmth and character to the space, it will last you a long time before it gets wrecked and needs replacing. 4. Something Green. I can’t promise your guy will even care about this suggestion but I think it adds a lot to a space: some kind of greenery or plant (no fake ivy vines please!). Adding something that gives the look of freshness will do wonders to keep the man cave from becoming a dark dreary dungeon. Asking your significant other to actually water and care for a plant is probably asking too much, so luckily there are some amazing faux greenery options out on the market now. You can get something small like a few potted succulents or go big with a beautiful fiddle leaf fig tree, which is one of my FAVORITE things right now. 5. Interesting Accent Chair. This is another component that elevates the design of the space and takes the vibe of the space from “I’ve just graduated and don’t have furniture but I have a giant TV” to “I’m an adult with an insanely cool man cave.” I love the idea of adding a cool Mid-Century piece, either vintage or new. 6. Durable Rug. If you have wood floors you’ll want to warm up the space and if you have a lower pile carpet you may want to protect it. Picking out a darker area rug with a pattern will help to hide any dirt or spills. I love all the over dyed Kilim rugs that are so popular right now. They add a feeling to the space that you’ve gradually acquired all the pieces in your man cave, rather than just running out one weekend and buying it all. 7. Man Art. Pick something your man loves and really showcase it. Is he a bourbon lover? Search the web for some cool Woodford Reserve promotional print. If he loves old cars then frame some muscle car ads from vintage magazines. When all else fails, you can’t go wrong with an abstract piece! 8. Cozy Walls. When picking your wall color, I love the idea of going dark. This space will probably be used mostly for TV viewing so you might as well make your man cave borderline cave-like. I’m a huge fan of olive green, navy and deep, deep brown. My go to picks for those colors are Benjamin Moore “Sharkskin”& “Hale Navy”, and PPG “Bark”. This really would be the gift that keeps on giving. Once your man is happily watching TV in his brand new man cave, you’ll have all the time in the world to paint your fingernails without having to hear about how “stinky” the lacquer is, or binge watch your favorite Netflix series, or even just lounge around and pretend you don’t hear the dryer buzzer going off again…and again.